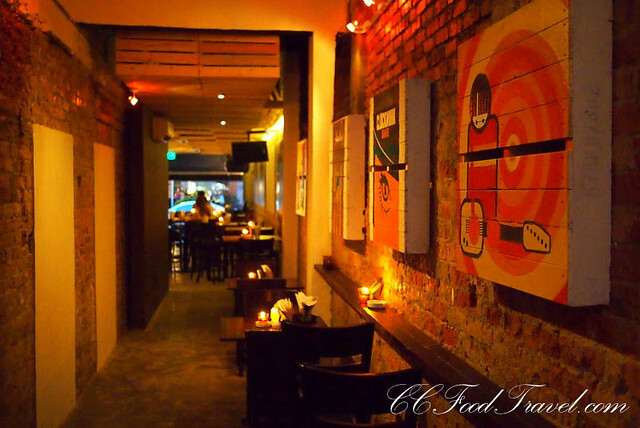 Finally.. Pisco Bar opens its doors to Kuala Lumpur.. I had my induction into Pisco, not too long ago. 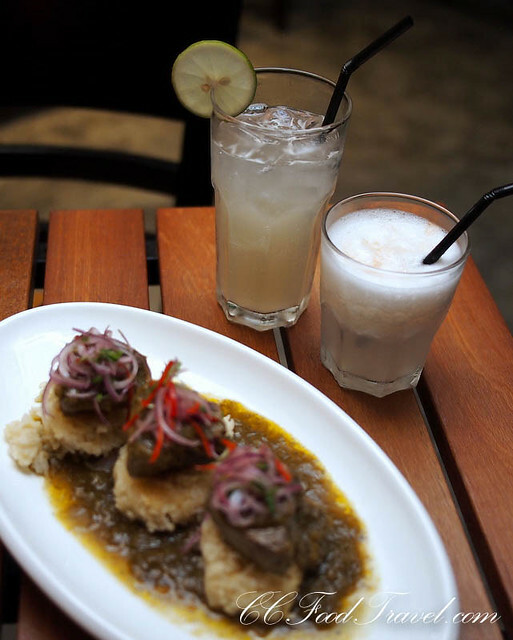 Being friends of Miguel Hokama, the only Peruvian chef in KL, we quickly got acquainted with the Peruvian way of kicking back and relaxing. After a couple of BBQ house parties and mingling with his Peruvian buddies, we soon learned what a trickster, this national spirit of Peru could be. 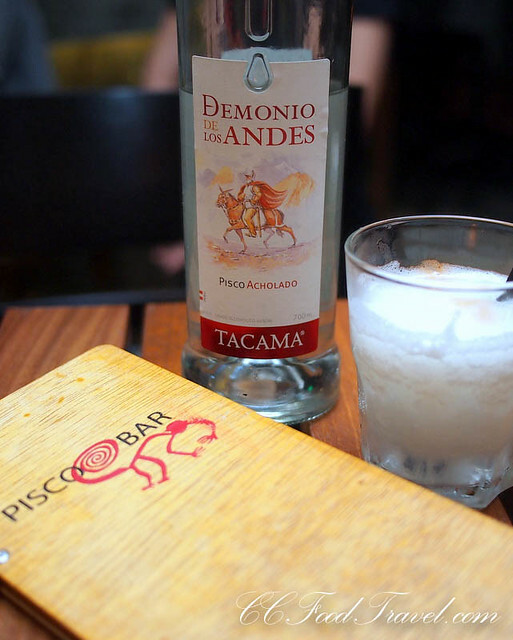 Pisco, appears clear and pure, yet before long, you are under the table. Peruvians like to say that good pisco will never give you a hangover, although after a night of drinking this tipple, I beg to differ. Pisco is made from a single distillation of young wine that holds the varietal qualities of one of eight different grapes from which it can be made. And like Champagne or tequila, Peruvian pisco is part of its country’s national pride – to be bona fide, it must adhere to strict, traditional production methods. 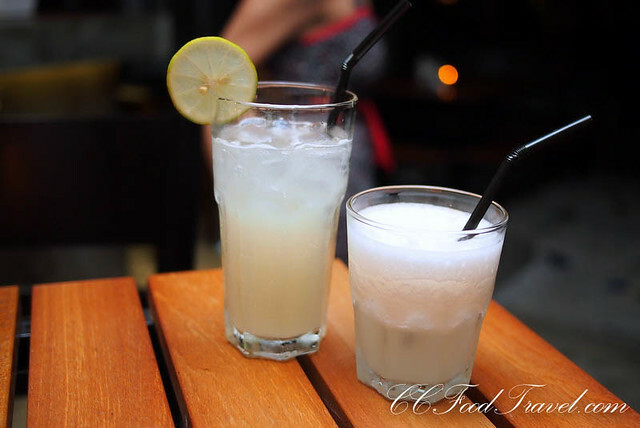 And every good Peruvian, has their own style and way of making the Pisco Sour. The national drink, the pisco sour, is an indigenous marriage of pisco, the distinctive Peruvian lime, egg white and bitters derived from the bark of a Peruvian tree. It even has its own national day of celebration, and the spirit must be served at Peruvian diplomatic functions around the world. Pisco might not be mainstream in KL as yet, but it certainly is gaining traction as the public is now becoming more exposed to it. Heck I love the drink. 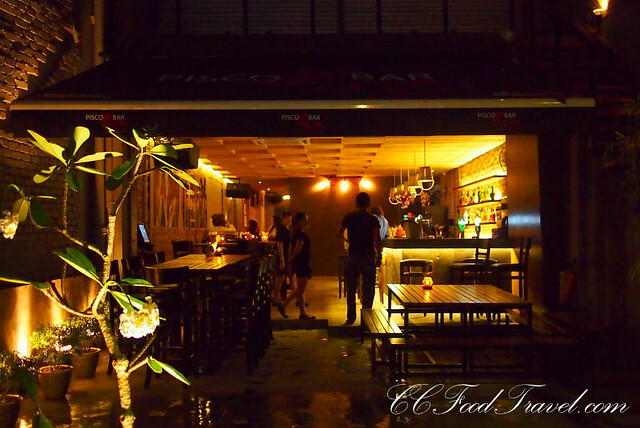 So when we heard that Pisco Bar, on Jalan Mesui, was finally open for business, with Chef Miguel Hokama helming the kitchen, we could not wait to check it out. Stepping inside the restaurant, you will notice a warm, rugged vibe with bare brick walls and unlacquered wooden beams for its ceiling. Black and white, larger than life, movie stills, from iconic movie scenes, decorate the walls. You can tell that the owners are really into their movies. 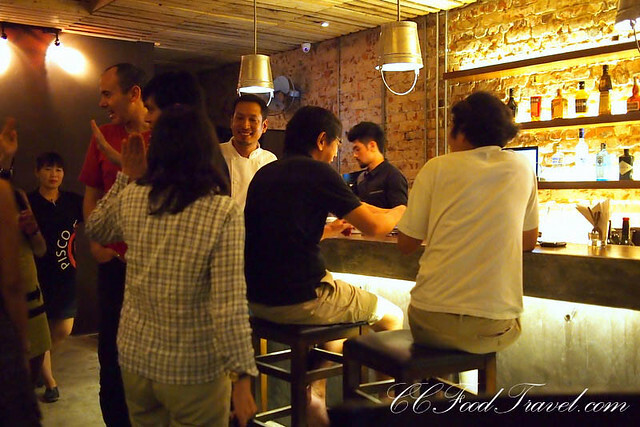 There is a bar which is essentially the main focus point of the place, and it runs half the length of the establishment. Upstairs is still under wraps, with plans to turn the space into a chill out area for events. We start with the pisco bites. 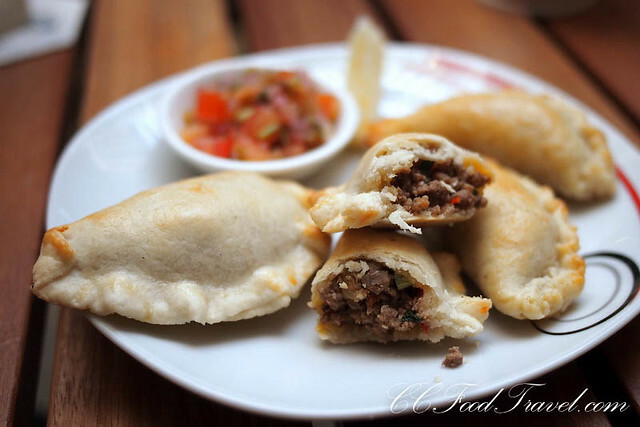 These baked empanadas have a soft pastry texture (as opposed to crispy like your curry puffs), are bursting with a delicious mixture of pork and beef, and served with a peruvian relish. If you don’t eat pork or beef, let the waiter/waitress know – since Chef Miguel is also accomplished in Japanese cuisine, he may be able to rustle up something suitable for your diet. The Peruvian causitas are a thing of beauty. 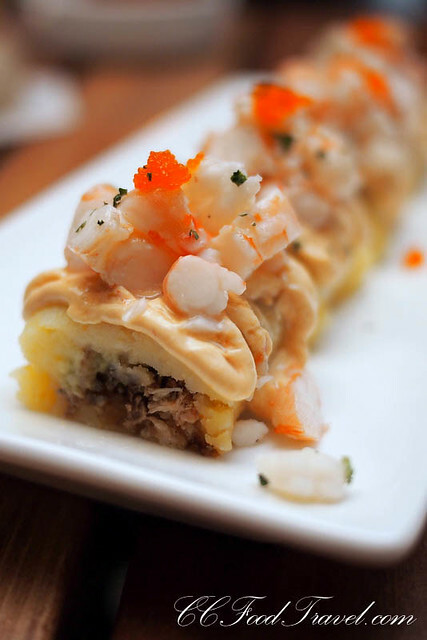 Using mashed potatoes as a base, this traditional preparation of freshly mashed potatoes, infused with key lime juice, yellow chili pepper, layered with soft shell crab, avocado, prawn roe, topped with prawns, and a peruvian homemade sauce.. oh, to die for! Spicy Creamed Chicken or Aji de gallina is a delicious Peruvian classic – slightly spicy and bright yellow from the famous aji amarillo peppers, and rich from the unusual cream sauce made with ground walnuts this was hubby’s favourite. And rightly so.. it was such a tasty snack. This dish is traditionally served over rice, with boiled yellow potatoes and black olives but at the Pisco bar, it’s all about the tapas. So instead of rice, it’s served on mini tortilla and garnished with a quarter of a hard boiled quails egg. I could eat an entire plate of these and not tire of it. Beef hearts – tasty stuff! 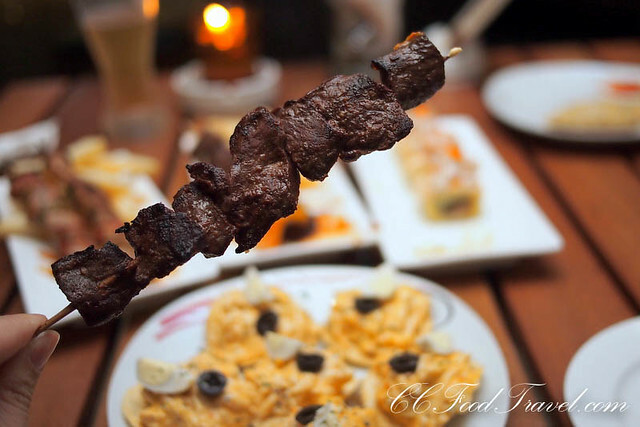 My favourite grilled skewers tapas was the beef heart skewers.. well seasoned, they had a nice chewy texture, without being hard. 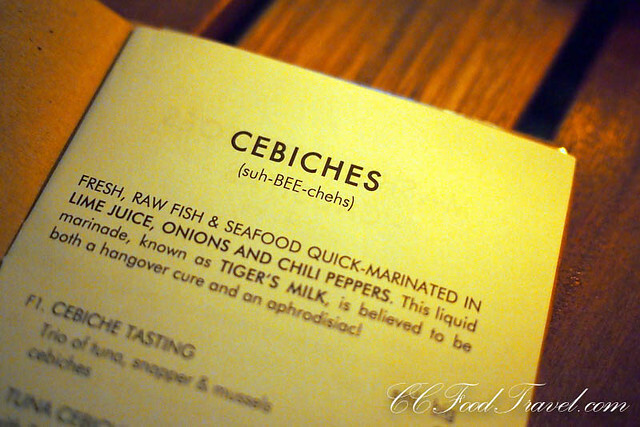 Cebiche or Ceviche but there’s only one way to pronounce it! Ahh.. I just die a little each time I eat Ceviche.. maybe its the way the delicious flavours are released when the acid from the limes and lemons change the structure of the proteins in the fish, essentially “cooking” the fish without using heat.. but yes, it’s one of the most refreshing things on the Peruvian menu. A must not miss. 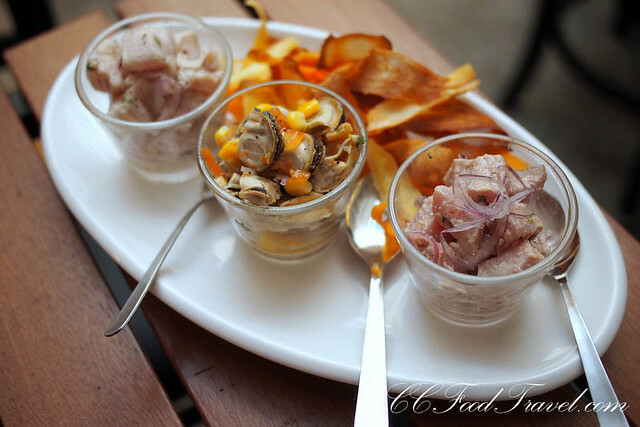 With the trio, you get to have your cake and eat it – a nice mix of tuna, snapper and mussels served again as tapas bites. Perfect for sharing. 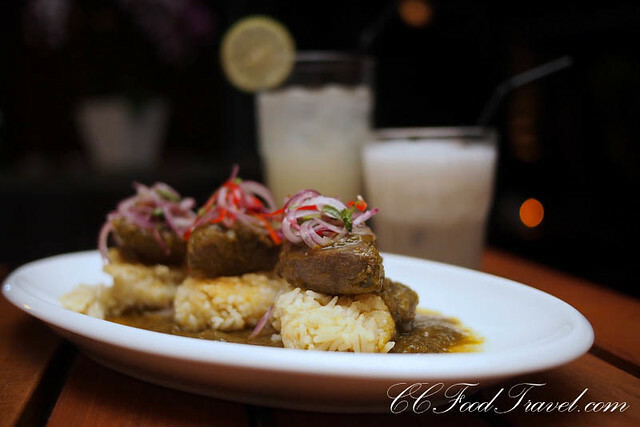 The Seco de cordero turned out to be an interesting Peruvian lamb stew. Seasoned with aji peppers, cumin, and lots of cilantro, the lamb is braised in beer until it’s tender and flavorful. The rice that’s fashioned into rice cakes and then pan fried with herbs and olive oil, serves to soak up the stew juices. 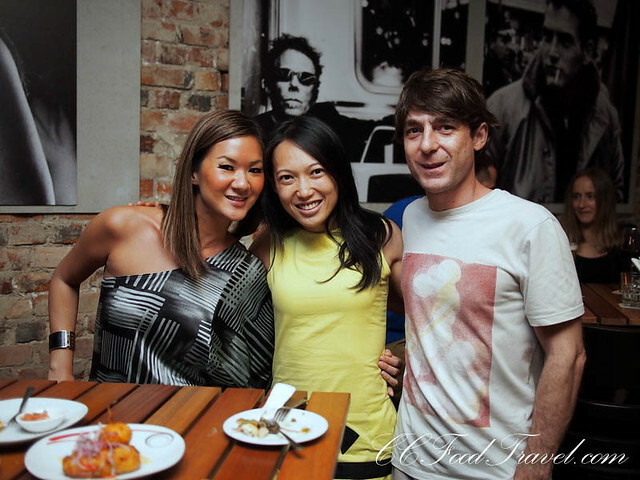 Speaking with Yvonne, it’s nice to hear about her vision for Pisco Bar. 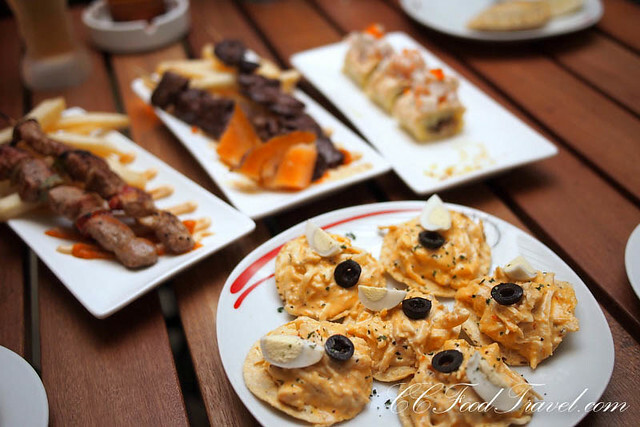 It’s really a place to mingle and get to know people from around the globe, while dining on Peruvian cuisine, which has an amalgamation of ethnic Peru, Japanese and Spanish influences. We certainly look forward to Pisco Bar prospering. 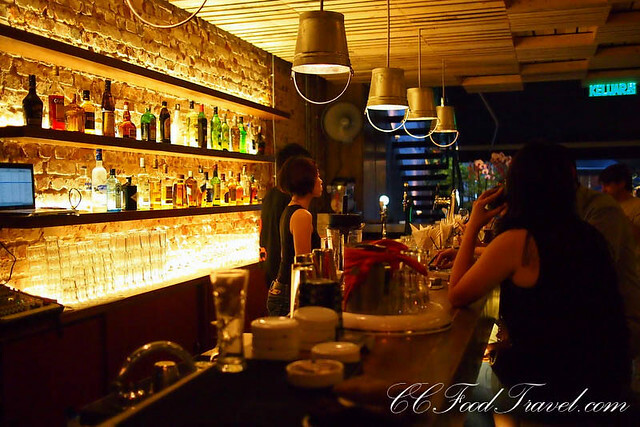 Located strategically on Jalan Mesui, just 2 streets away, parallel to the noisier Changkat Bukit Bintang section, the bar would be able to cater to the unique mix of residents in this area. From fancy serviced apartments and regal hotels to the basic flats and dirty back-lanes that hold a unique mix of yuppie expats, international travelers, local folks and foreign migrant workers, this area provides any visitor with an interesting feel of KL culture, not to mention a variety of cuisine to feast on. Love the cocktails here. All the Pisco concoctions come highly recommended. The bartender has perfected the art of making Pisco Sours, no doubt. 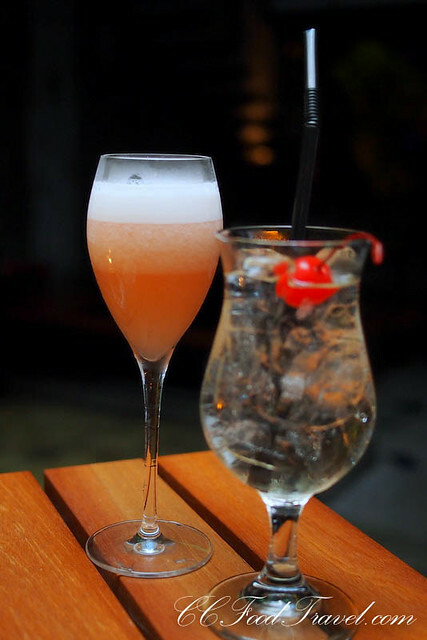 Non-pisco based cocktails are just as good – we tried the elderflower martini and the bellini. The Bellini was one of the best I’ve tried in town, employing fresh peach juice and puree as a base. 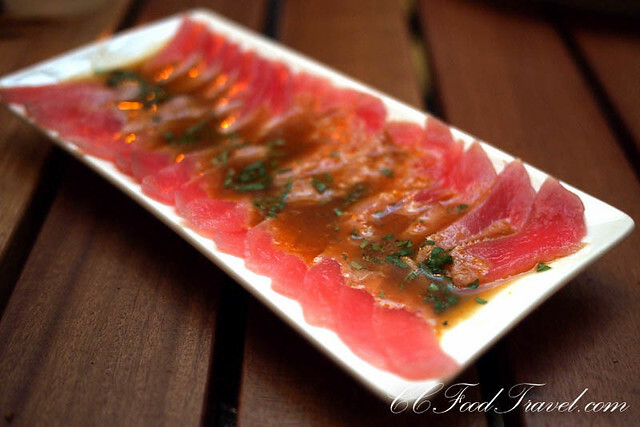 Tangy and tart, slivers of rosy sashimi tuna, the tiradito sashimi tuna is another top notch fish dish to try at the Pisco Bar. The PiscoBar.. when we get back from Myanmar next week, you can be sure that we will be back for more of them addictive cocktails and Peruvian cuisine! what a lovely place to perch on!!! Their chow looks remarkably scrummy tooo! Yoorrr! I wanna go! Excellent food and cocktails.. highly recommended.. This looks lush! I’ll pass on the info to my friend living in KL. He’d love it! Oh great stuff.. thanks Ange! Hi, can I check with you whether you provide outside service catering service ?? is have may I know what are the packges and its price for the cocktail? ?waiting for you soonest reply.